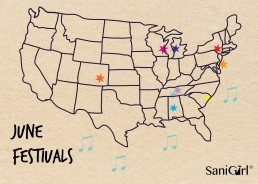 Music Lovers – June holds many great festivals in the USA. Here is the MIX – different festival types and music types. Some are immerse yourself and camp there festivals, others are perfect for combining the festival with a little beach time or sightseeing. Check the Map – the Lineups – the Dates – and hit the road in June! 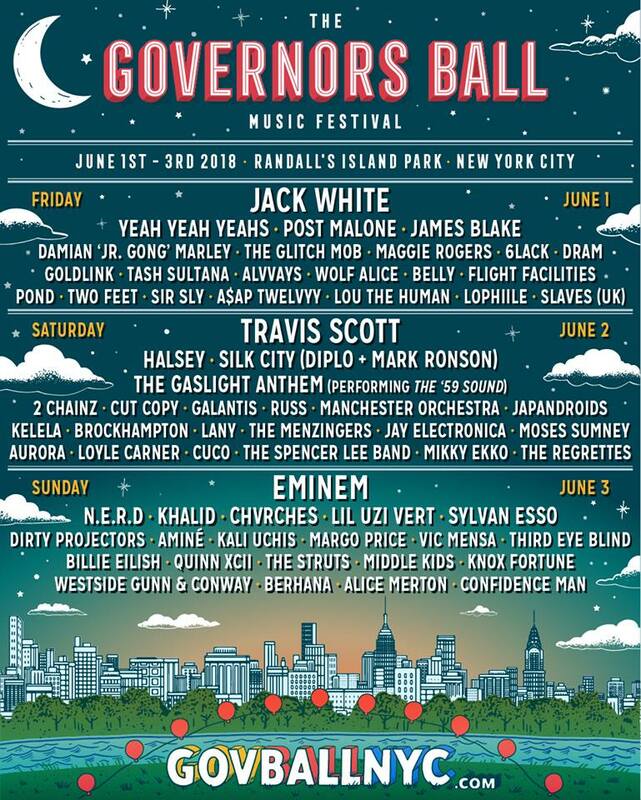 The Governors Ball Music Festival is New York City’s music & arts festival. It features music of all genres, foods of all flavors, arts of all variety, and more. The festival started 8 years ago by music lovers from NYC. In 2017, about 150,000 visitors flocked to Randall’s Island for Governors Ball Music Festival. With 60+ artists of all genres across 4 stages, there is something for everyone at this festival. The festival draws from the eclectic spirit that makes NYC so special and provides people with a first class experience for all the senses. Diverse lineup. 10 Stages. 4 days. Great vibes. An immersive experience for about 75,000 happy campers. Located on hundreds of acres of Tennessee nature. This is THE CAMPING festival for June – for sure! 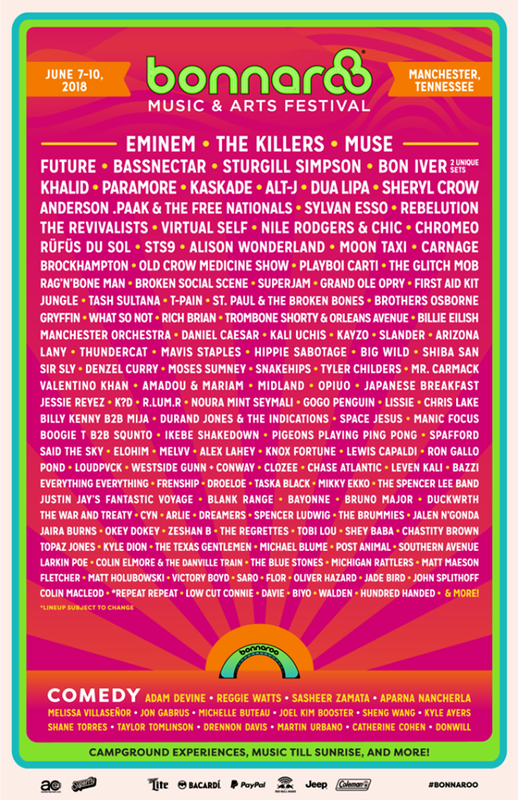 So if you are looking for a weekend to get away from it all – head to Bonnaroo! Camping is the way to experience this festival. Even if you fly into town, you can still camp! Bonnaroo has many options to personalize your camping & fit your own style from the most popular car camping, to RV, have them set-up a tent for you including gear, & then yes there’s the Glamping options too. Make a group camps or be part of community camps like for Solos, Families, Women, Sober, etc). Camping is very organized, and broken down into Plazas this year (replacing Pods) for the community to gather & enjoy the scene, as well as access amenities (like toilets and showers… you know, necessary things). No matter where you’re camped, you’ll have a Plaza nearby which is your landmark. It’s a positive vibe, diverse crowd, and festival goers follow the Bonnaroovian Code (respect, positivity, harmony). Sure to be EPIC again in 2018! Originally intended to be a one-year celebration/recovery from the tornadoes of that devastated the area in 2011. But now, Rock the South returns for its 7th year & continues expand. Billboard rates it as the 6th Best Country Music Festival in the United States. It’s a festival about two things- giving back to the community and celebrating the Southern Culture we know and love. This year’s Country Music Headliners are: Eric Church, Thomas Rhett, Hank Williams Jr, Brett Young, Lauren Alaina, Riley Green, The Marshall Tucker Band, Dylan Schneider, Upchurch, & Travis Denning. The Ultimate Country Music Fan Experience™ which began in 1972 is now in its 47th year. It’s the city’s signature Country Music event. 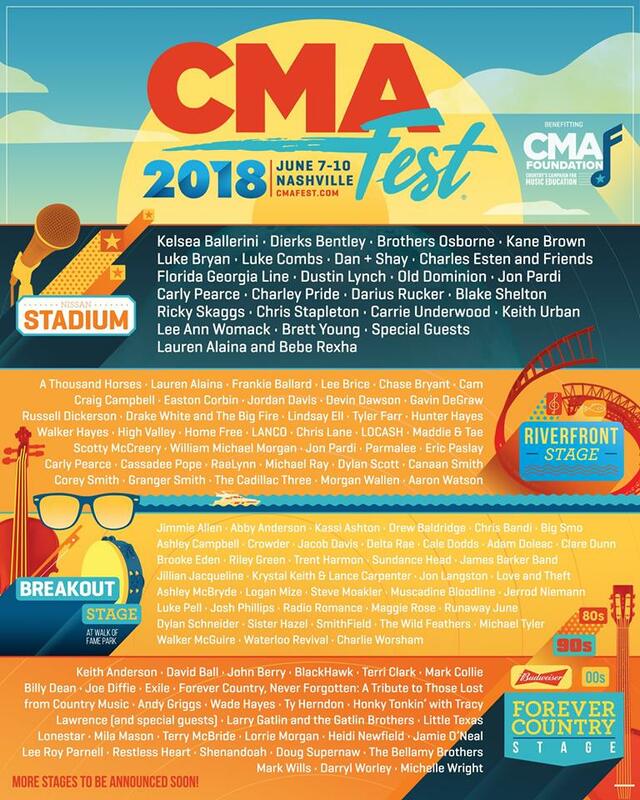 CMA Fest attracts 400+ artists and nearly 90,000 fans. During the four days, Country artists donate their time and talent to 11 stages to raise about $2.5 million for music education. Since 2006, CMA and the CMA Foundation have donated more than $20 million to sustainable music education initiatives across the U.S. thanks to the fans who attend CMA Fest and the artists who perform for free. This festival has 7 stages running over 4 days which makes this a great weekend to descend upon Nashville, TN. Grab a cowboy hat and a pair of flip-flops, as country music meets the scenic shores of Myrtle Beach when the boardwalk becomes home to the Carolina Country Music Fest! CCMF is back for the 4th year in a row & is bringing 30+ of country music’s hottest artist to perform in Myrtle Beach, SC. 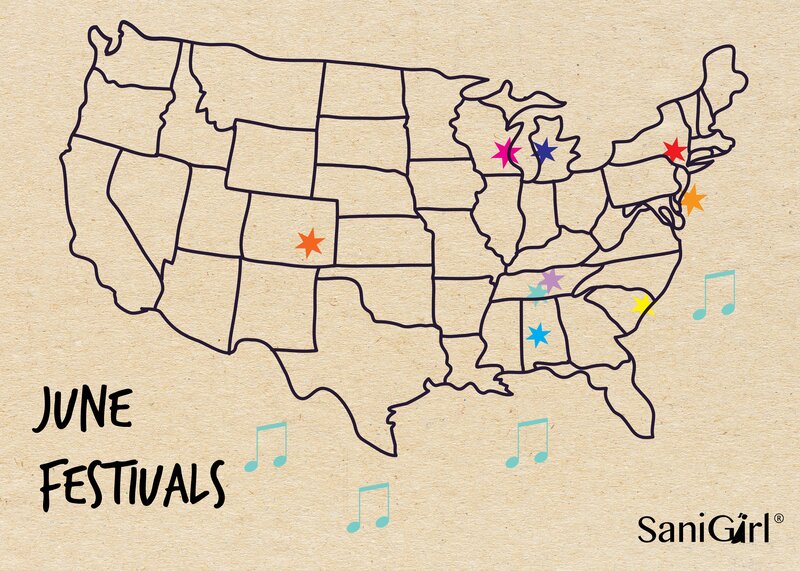 It’s the East Coast’s largest 3-day outdoor country music fest. Some highlights will be Luke Bryan, Toby Keith, Zac Brown Band, Cole Swindell, Brett Eldredge, Chris Lane, Old Dominion and more! 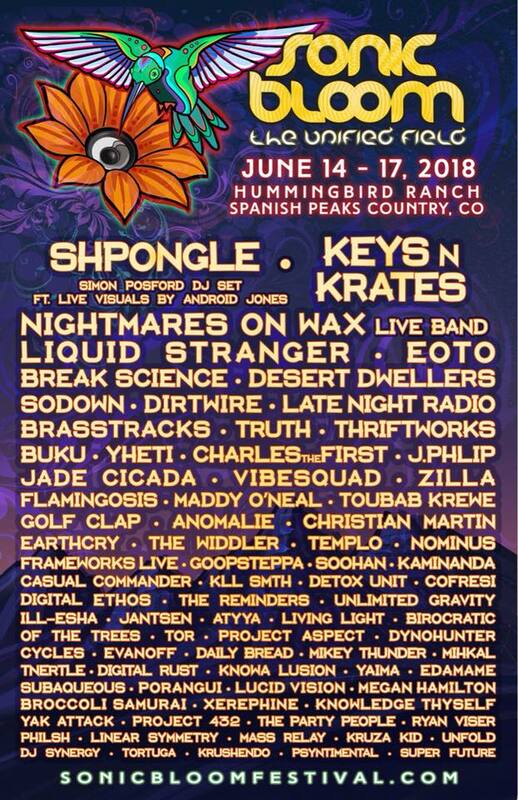 It’s the 13th annual SONIC BLOOM, 4-day camping festival that brings electronic music, dance & art and together in a smaller festival community. The grounds have shady trees, a pretty creek, and beautiful mountain views. This fest probably has the coolest night temps of all the June camping fest’s, so keep in mind temperature swings. This festival looks like it has the most amazing sky of the June festivals to camp under the Milky Way. The music = high quality, cutting-edge live electronic artists & producers that help create a cool intimate boutique festival experience. Festival goer’s rave of the community here and how the people connect together. 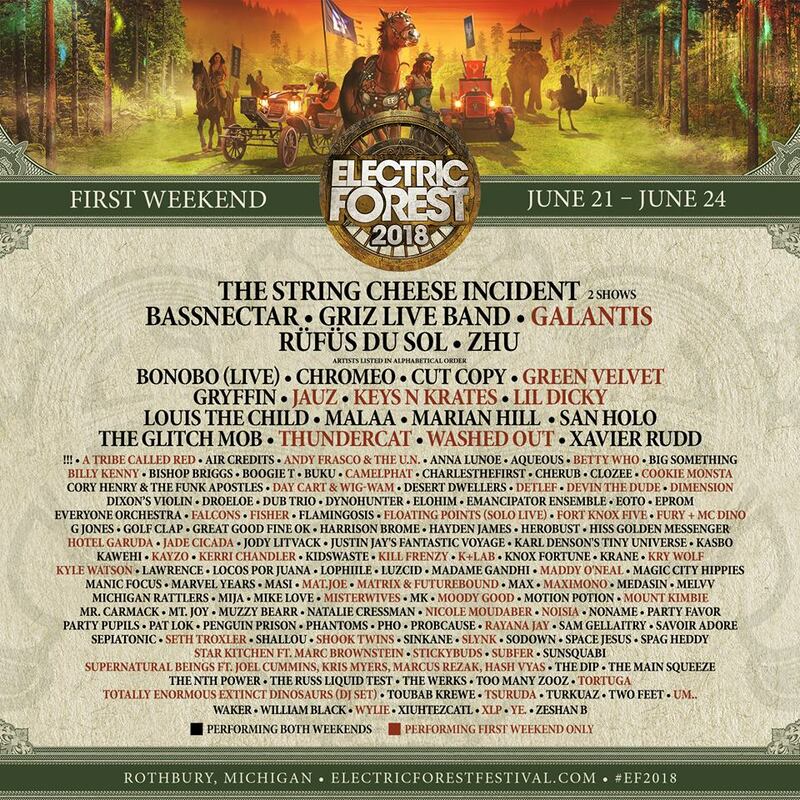 The first Electric Forest festival was held in summer 2011 at the Double JJ Ranch, In Rothbury, MI. By, 2017 the Forest grew to be a two-weekend event. It sounds like there were at least about 65,000 tickets sold for last year. The setting is pretty as it is and the festival transforms it into a magical place. It has the plus of permanent facilities, a massive campground, and other RV, Cabin stay options. The EF prides itself as chill and positive atmosphere of good vibes. The organizers are credited for great attention to detail by the festival goer’s. 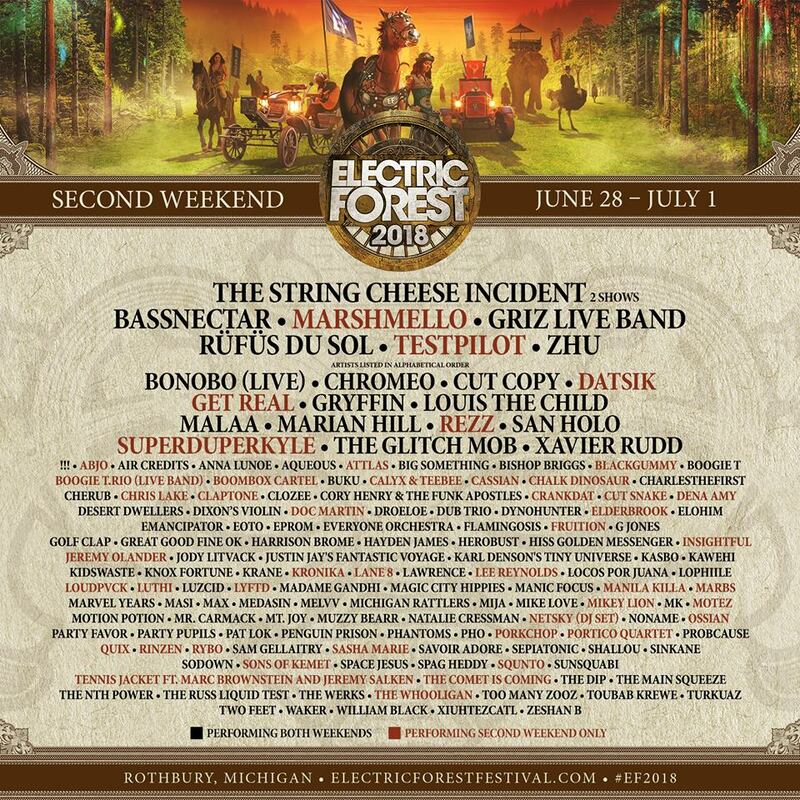 Electric Forest is also notable for attracting music lovers of all genres to its magical electric venue. 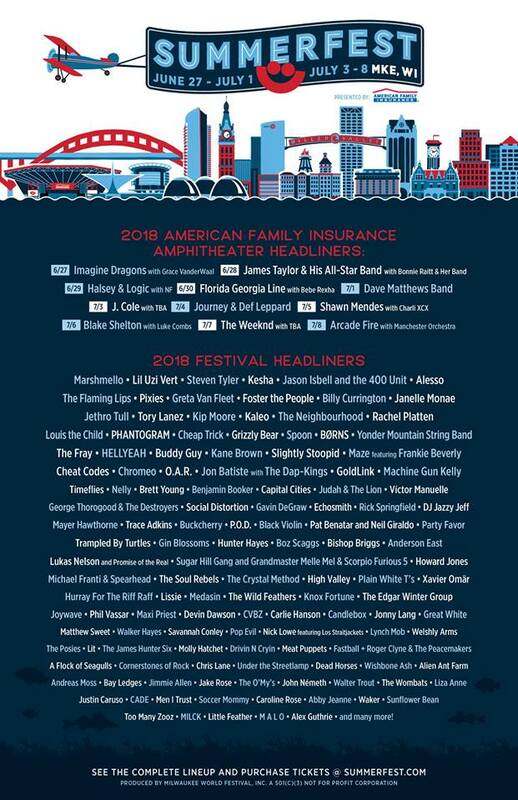 Check out the lineups for Week 1 and Week 2 below and visit their website photo gallery – it truly looks like the Disney World of music festivals. Summerfest has been running since the mid 1970’s. It lasts for 11 days, is made up of 11 stages attracting between 800,000 and 900,000 people each year. Aka The World’s Largest Music Festival. It’s along the scenic lakefront of Milwaukee, WI and simply has music for all ages and likes. The diversity of music at Summerfest is second to none. Take a look at the headliner lineup and you’ll see the huge mix. It also has comedy acts, and other family activities like paddle boats and a sky glider. This festival is a good value too since it’s only $100 for an 11 day pass. Buy only the concerts for the amphitheater you want and you are still ahead $$ over other festivals. What’s the main complaint about festivals?? Replaces the EW! With Aah!! In the bathroom. The product that keeps you clean and happy away from home. SaniGirl sanitary pee funnels give women and girls total peace of mind on the go. Carry SaniGirl to avoid germs and unwanted exposure. Perfect for traveling, music festivals, camping, hiking, and more… Just stand at ease. No more squatting, dirty clothes, backsplash, or worry about unsanitary & unwanted exposure. Do share – What June Music Festival do you like the best and why?